Before we get started with this segment of the Interior Finish Work, I would like to mention that it is no easy to task getting good interior photos as the work is progressing. 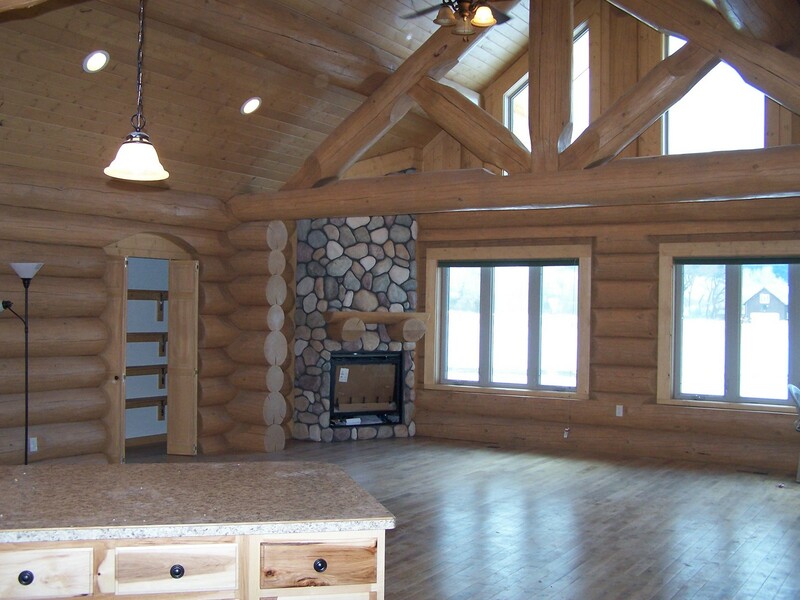 So please bare with me as we explore the interior of this lovely log home. Some photos posses a better quality than others, but I hope you can look beyond the photos limitations and get a feel for the beauty of this custom home. Then next phase beyond the rough-in is to finish the tongue and groove ceilings. This finish work was interspersed with other finish carpentry, both inside and outside the home. 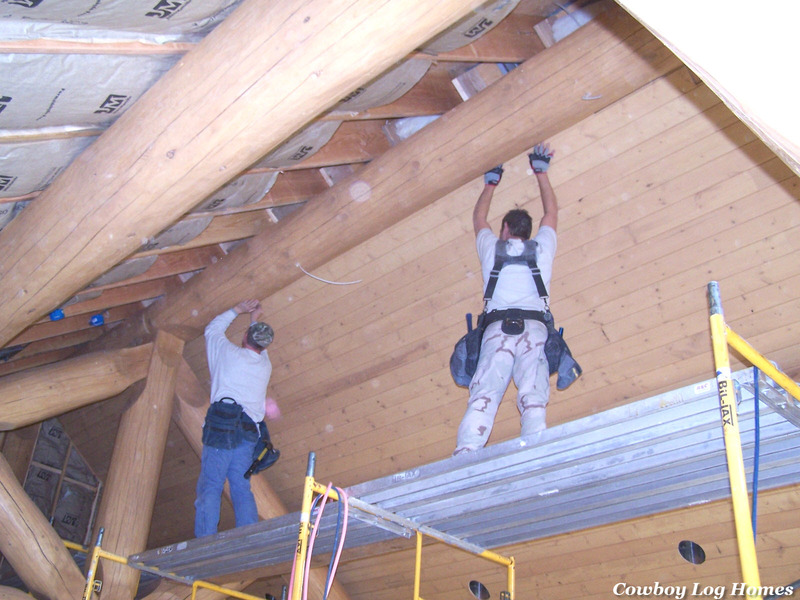 First we begin by installing the insulation bats between the 2×12 Douglas Fir rafters. 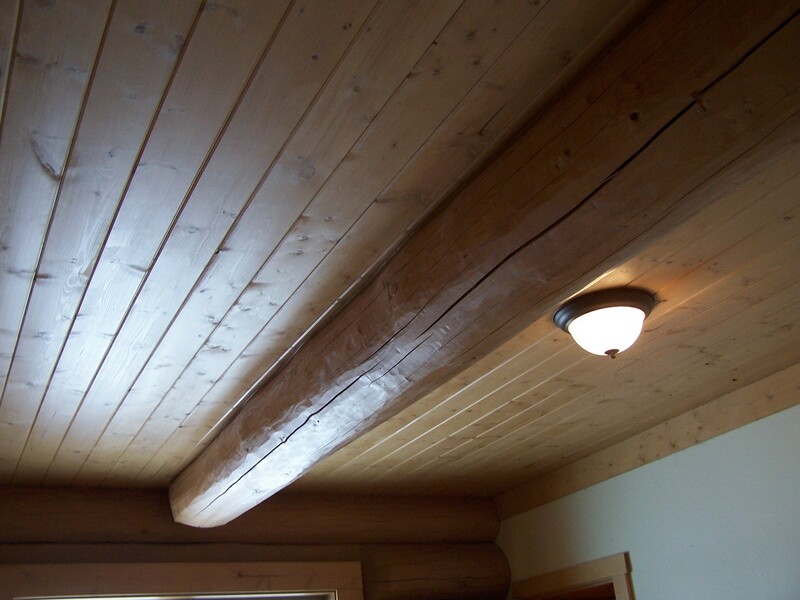 Then the 1×6 pine tongue and groove is hung on the ceilings. The tongue and groove was stained before installation. The tongue and groove pine is begun at the bottom of the cathedral ceiling and then installed one row after the next. Here we see Mike at the peak fitting the last pieces by the ridge beam. Looking upwards at another section of the ceiling we see the recessed lights have been scribed around with the tongue and groove. Also, close inspection of the ridge shows the black air vent sheets that are sticking up just beyond the ridge beam and the edge of the insulation. Here we see the king truss and the tongue and groove ceilings completed. 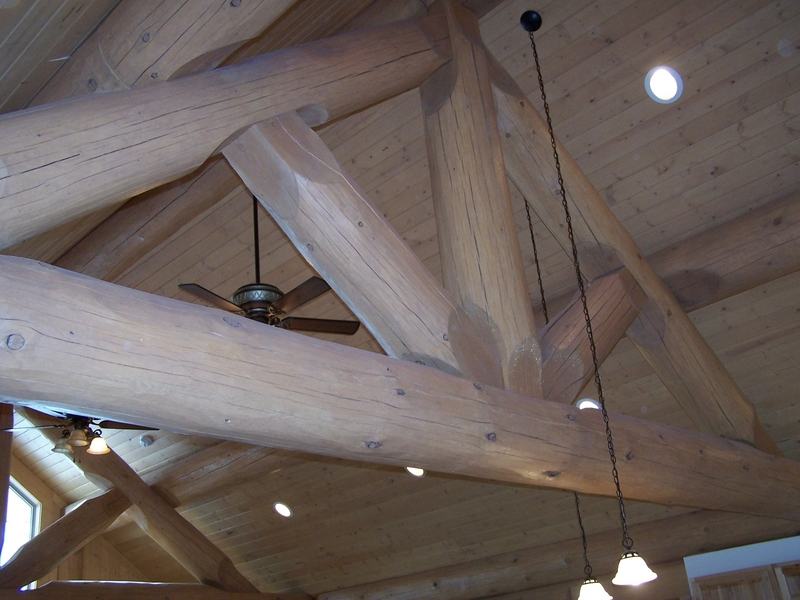 The great room of this log home has two king trusses. This one is located over the kitchen area. 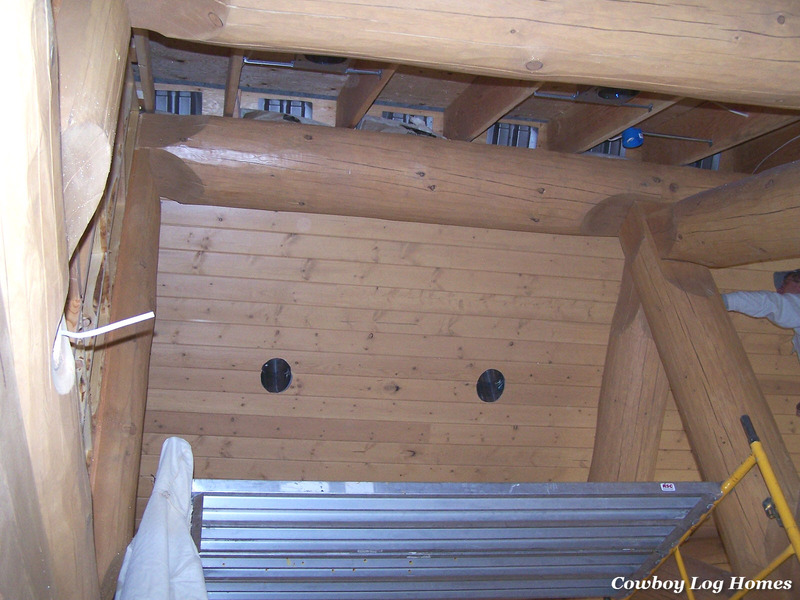 Close inspection also reveals that the 1×6 pine tongue and groove is installed on the gable end wall of the great room. Looking diagonally across the great room, both of the king trusses can be seen. The lighting fixtures and ceiling fans have all been installed. This is the ceiling of one of the bedrooms. A log purloin is also see traversing the room. 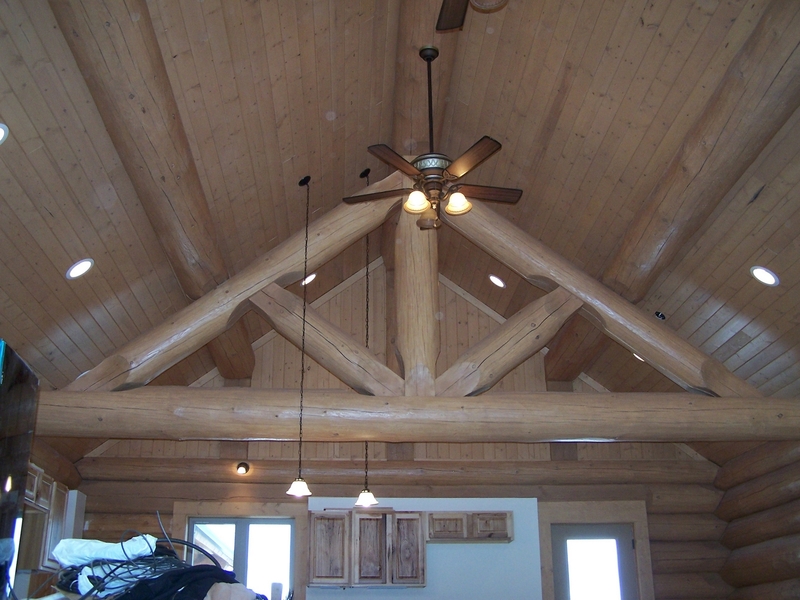 The choice of wooden ceilings matches a log home very well and is most often preferred over sheet rock for this location in log homes. 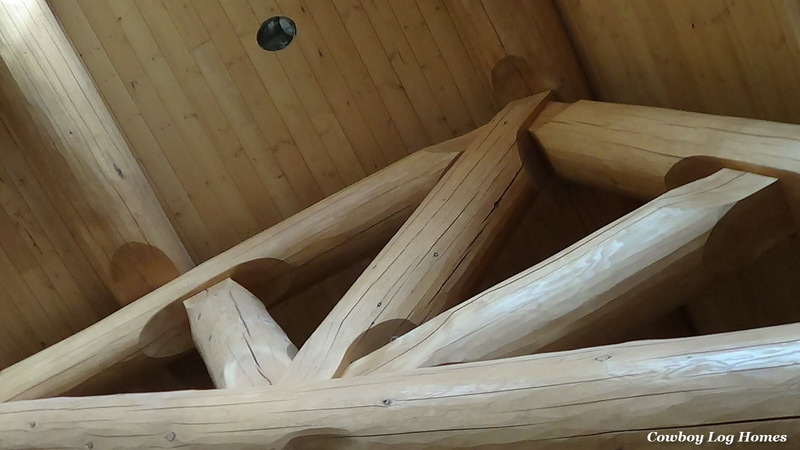 And finally we see the finished great room of the log home. This photo was taken just a few weeks before the owners moved in. This room is entirely finished in wood except for the wall where the kitchen cabinets hang (which is directly behind the were the camera person is standing.) The rock fireplace nestled into the corner also gives more floor space inside the great room than a fireplace located in the center of the great room, such as the original Montana Plan offered.